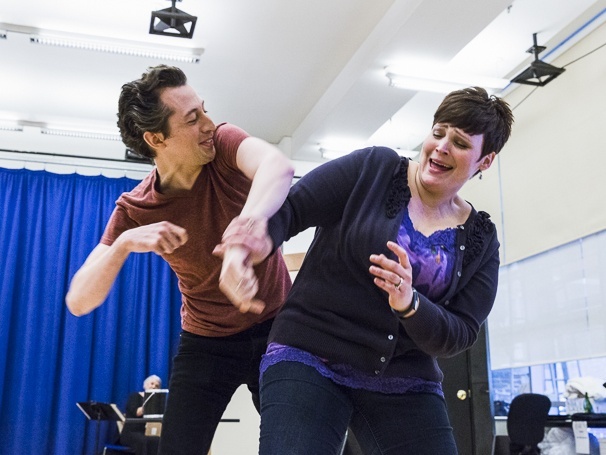 Marty (Josh Grisetti) and Jenny (Lisa Howard) play rough. Go behind the scenes with Sierra Boggess, David Burtka and the cast of the new Broadway musical comedy It Shoulda Been You in rehearsal! Click for exclusive photos by Broadway.com photo editor Caitlin McNaney, then see the new production beginning March 17, 2015 at the Brooks Atkinson Theatre.